Jazz and Cocktail Piano, small to medium sized bands with or without vocals. 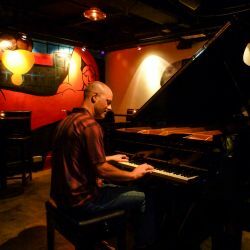 Scot plays jazz piano in Vancouver, B.C., Bellingham, Seattle, Portland, and other cities on the west coast. Extensive experience in leading house bands in upscale venues overseas in Hong Kong, South Korea, Japan, and other cities. Scot's music is fun, professional, and memorable. Solo jazz piano is one of my favorite settings because there is nothing in the way of the music except my imagination. House parties, lounges and bars in hotels and other venues, corporate events that need cocktail piano, dance classes that need live music, and more all are perfect settings for my style of solo piano. You'll hear a mix of fun, funky, bluesy, and beautifully crafted ballads and standard cocktail piano music that's difficult not to enjoy. The rhythmic aspect of playing piano for dance classes is what I like best about playing for dancers. The percussiveness of my playing has seemed to work well for dancers who need that strong rhythmic element for practicing or performing. I have a large repertoire of music that works well at assisted living centers and especially memory wards. I've been told by activity directors that residents respond to my piano music more than a lot of other music. Playing in these situations is a lot of fun for me, too, because I like playing for people who love the music (who doesn't?) and especially hearing all the stories they tell. Thank you for being such an enthusiastic, reliable and dedicated entertainer for us! You're a terrific piano player and your energy and skill combined have made you one of the resident favorites. Every time you wrap up a performance, I have residents expressing how much they enjoyed your music and many times they tell me you're the "best one we've got." The trio is a swinging jazz piano trio with a super-tasty mix of classic jazz and just enough popular and local music to create entertainment everyone can enjoy. This is the type of music Scot has focused on for the majority of his career as a professional jazz pianist, and this music is consistently well received by local and international audiences during this time. The piano and bass duo is perfect when a trio is not needed but solo piano isn't quite enough. The duo provides an excellent sound that gives a room a sophisticated ambiance without demanding attention. Chico's is a reggae/jazz/rock/funk band specializing in music that is fun, easy to dance to, and is a nice mix of jazz and other styles. Chico’s plays at Mt. Baker Ski Area during the winter seasons and around Bellingham in the off season. Currently, this band has Travis Ranney on sax, Kevin Chryst on drums, Andrew Simmons on bass, and Scot Ranney on keys. Travis Ranney is one of Seattle's premiere jazz saxophone players and features a big sound, brilliant technique, and swing sensibilities that are reminiscent of classic players like Al Cohn and Pete Christlieb blended with the tastiness of Stan Getz and the edge of more modern players like Michael Brecker. The Ranney Brothers duo is perfect for events that are looking for smaller groups that don't lose their excitement and can entertain small or large audiences. You guys swing harder than an entire big band! ~Ramsey, Anacortes Library "Ranney Brothers" duo concert. We so enjoyed your performance with your brother at Sand Point CC in Seattle last November. We are putting on another party and we hope you will be available! Testimonials - People say the nicest things! It's always nice to receive notes and letters from people who enjoyed the music or the job that I've done. I think part of the appeal is that my music is always fun, which reflects who I am. I smile a lot, I enjoy engaging the audience, and it's important to me that everyone is having a good night no matter where I'm playing. Scot has led bands in this incredible establishment twice and will always seriously consider any overseas opportunity. We have been impressed with the Scot Ranney Trio’s repertoire and performance. There have been many occasions our guests at the hotel have commented their exemplary performance. The band has always ensured to accommodate their clienteles requests while performing. I can state that the band “Scot Ranney Trio” is a very talented band and I would recommend them to anyone seeking competent entertainment. I wanted to thank you again for your performance last night. I really enjoyed your performance and the way you interact with your audience and how it made the evening special for our guests. Your energy inspired me and I would love to have you be more involved here at the J! This was a transition time for the Ritz in Aspen. Scot started playing while it was the Ritz, then it changed hands twice and ended up being a St. Regis. It has been our distinct pleasure to feature the Scot Ranney Trio at the St. Regis Aspen for the past year. Not only are these gentlemen very talented, but they have a wonderful, warm rapport with the guests, who are very appreciateve of their fine efforts. Scot and his associates present themselves very professionally and always strive for perfection. These gentlemen are also very good ambassadors of our hotel and its outlets, properly promoting it throughout the community and among out hotel guests wherever appropriate. In my opinion, this sets them far above the caliber of many musicians I have worked with in the past several years. I feel they would fit very well in any fine, upscale establishment. Scot spent close to four years leading bands at the Grand Hyatt in Seoul, South Korea. I would like to take this opportunity to congratulate you and the other members of the band on your outstanding performance during your time here. You have assisted in providing our guests with styles of music from jazz to blues as well as pop, and building J.J. Mahoney’s reputation for entertainment excellence. Once again, thank you for your hard work and valued effort. I look forward to working together with you in the near future again. Canlis Restaurant is one of the top restaurants in Seattle and has a tradition of including piano music for their guests. Canlis has won many awards in it's close to 75 year history, including the winner of coveted James Beard award in 2017. Scot played on and off for Canlis private events and piano lounge for many years. Thank you so much for consistenly entertaining our guests so well at Canlis! We are so honored to have the pleasure of your music here at Canlis. A very heart felt “thank you” for being such a consistent and talented addition to our Penthouse events. Thank you for doing such an excellent job at Canlis! Scot treats any event with the same professionalism and class. Your music really set the mood for the evening. It was the perfect accompaniment for the elegant nature of the event. Thank you so much! Thanks so much for providing such wonderful music at our event. Your duo added the final touch of class to an elegant evening. Scot will often donate his music to good causes. You are excellent musicians, I’ll be looking for you in the community! Thanks for sharing your time and talent with our volunteers! It has been my pleasure to feature the piano and bass duo of Mr. Scot Ranney and Mr. Andrew Simmons in the Aspen Grill at The Ritz-Carlton, Aspen, for the past year. It would be a pleasure to recommend Scot and Andrew for any musical engagement. When the original band for the "Queen of the West" dropped out two weeks before the inaugural cruise season, Scot was called in the put together a band at the last minute. The band was supposed to be temporary, but the guests enjoyed the music so much that the band was asked to stay on for the full season. I would like to thank you personally for your enthusiastic and successful efforts in providing a professional level of entertainment on the Queen of the West during her inaugural season. I would especially like to extend my gratitude for successfully organizing rehearsals with our walk-on performers, building a complete set of music books containing nearly every song the guests could think of, and when problems arose on the boat you provided quality entertainment above and beyond the call of duty for the passengers. We received many excellent comments about the band and your level of professionalism, entertainment, dedication, and warm hearts of each band member from the passengers and employees. We hope you will consider working with the American West Steamboat Company again when the season begins next spring. Wherever Scot is living, he likes to perform free concerts for the community. When he's in Bellingham, he often performs a summer and winter solo jazz piano concert free of charge for the local community. He did this for quite a few years at the Whatcom Museum and continues to support the community at public events. Thanks so much for your special summer concert at the Whatcom Museum. We enjoyed hearing your own compositions and had a full house for the program, an eager audience. Everyone enjoyed the afternoon of music. How great that you are willing to share your talent and energy and enthusiasm with out community through your museum programs. Programs like yours help the museum be a real part of the community we are so pleased to have you perform in our Rotunda Room. Wherever Scot plays he brings his energy, enthusiasm, and love for playing music. It could be a piano stuck in the corner of an elevator shaft, or at the top of the tower. You obviously enjoy entertaining and interacting with people, as your enthusiasm was felt by all. We were further impressed by your incredible repertoire, style, and professionalism; our clients, young and old, found something to relate to in your selections. … Thank you for again for sharing your wondering flair for music and fulfilling our entertainment needs.